This is an annotated transcription of an 1886 April 12 News clipping. It concerns an award which was presented to Thomas Jackson in 1886 prior to his departure when he first left Hong Kong. Jackson was the Chief Manager of HSBC, and had been the Chairman of the Victoria Recreation Club for a decade prior to leaving the Colony. NOTE: The version that I worked from is at HSBC Archives in London: HQ HSBCS 0016/0006a/0040. Sharon Oddie Brown. November 7, 2012. Photo by Venetia Bowman-Vaughan. The document was recently donated to HSBC Archives in Hong Kong by Annabel Bowman-Vaughan. Proceedings of the Victoria Recreation Club on the afternoon of the 9th inst. bore ample testimony to the fact the Club is now losing for a time one of the most popular Chairmen it ever had. No pains had been spared to make the affair thoroughly representative of the unanimous good feeling entertained towards the Hon. Thomas Jackson by the members. For 10 years Mr. Jackson has occupied the post of chairman of the Club, filling that position, as Mr. McEwan aptly put it in making the presentation, with good-humored tact. He has always evinced a hearty interest in the sports of the members and has done his best promote them. Under his sway the Club has gone on smoothly and prosperously, and the members felt that they ought not to let the hon. gentleman leave them without presenting him with some mark of their warm appreciation of his conduct. Accordingly a subscription list was started, and though the amount was limited to $2 per man, there was soon a handsome sum got together. With this sum the committee procured in Canton a very handsome folding screen, and Friday afternoon was the time fixed for its presentation. The somewhat unornate building of the club was made to assume like a gayer and more attractive appearance than it ever been known to present before, and the steward and his assistants deserve much credit for the way they have worked in the matter. The entrance gate was decorated with foliage, and a red carpet was laid down the steps to the entrance to the building, while the covered way from the boathouse to the bridge to the bath was all draped with flags, interspersed with wreaths of green leaves. The bar was similarity treated, while the gymnasium in which the presentation was made, looked very attractive. The walls were completely draped with green wreaths, and on each of the brick pillars were crossed oars with an ornamental shield in the center. Overhead hung strings of lighted Japanese lanterns, and the place was quite brilliantly lighted. At the east end of the room, on a raised platform, stood the presentation screen. This was selected by Mr. G.D. Böning, and was very generally admired, being a beautiful work of art. It is a large folding screen, in a massive ebony frame, most elaborately and artistically carved, and tastefully inlaid with mother of pearl. The panels are filled with very handsome needlework in silk, representing birds of brilliant plumage, flowers, &c. Silverplate is affixed to the screen on which is engraved this inscription – “Presented to the Hon. Thomas Jackson, for ten years Chairman of Victoria Recreation Club, by the membership; Hongkong, … Illegible…proceedings … illegible … at six o'clock the attendance of members being very large, including many of the older members whose days of active participation in the aquatic sports or gymnastics are past, but who still feel the warmth and interest in the Club. On his entering the gymnasium Mr. Jackson was greeted with hearty round of applause. Mr. A.P. McEwan undertook on this occasion the functions of Chairman, and he made a presentation with the following remarks: – Mr. Jackson, on the eve of your departure from the colony we have invited you to be present here this evening in order that we may express to you personally our thanks to you for the kind interest you have ever shown in encouraging the recreations of the members, and the time you have devoted to the affairs of this Club during your term of chairmanship – (loud applause) – and also to ask your acceptance of this souvenir as a small mark of our appreciation of your kindness, accompanied by an address. I think the presence here this evening of such a numerous body of the members of this Club will convince you more than any words of mine can of the kind sense of appreciation that those services are held in, and may also serve to assure you that the signatures attached to this address are the names of honest admirers and good friends. (Applause.) It is now some years since you accepted the position of Chairman of this Club, and during that time the members have increased considerably, and the financial position of the club is a sound one. Now I'm not going to say that the signs of progress and prosperity are due to you and to you only; but what I do say is this, and I feel certain that everyone present in this room will agree with me – that it is in great measure owing to good humoured tact you have displayed in the management of this club that there exists that mutual feeling of good fellowship among the members, and that it has worked so harmoniously for many years past. (Hear, hear and applause.) I may say that when there has been any difference of opinion it has always been settled in an amicable spirit, and to the satisfaction of majority of the members. (Renewed applause). The branches of exercise which the Club promotes are swimming, gymnastics, and boating – and I think your name will ever be most associated with that of boating. (Applause.) I'm not aware of whether in your younger years in this colony you ever assisted in the manning of the boats at all, but of late years you have materially assisted the success of the gatherings by your genial presence on board the flagship at our annual regattas; and last, but not least, you have ever been a generous donor of a handsome prize, which has yearly been largely competed for – the Chairman's Cup. (Cheers.) I draw your attention to the names of 40 or 50 gentlemen of this Club have rowed for that prize during the last ten years. I will say on behalf of this club that of the many sincere friends you have in this colony, none are more genuine than the members of the Victoria Recreation Club (Loud applause.) I will ask the Hon. Sec. Mr. Lockhart, to read the address. Mr. J.H. 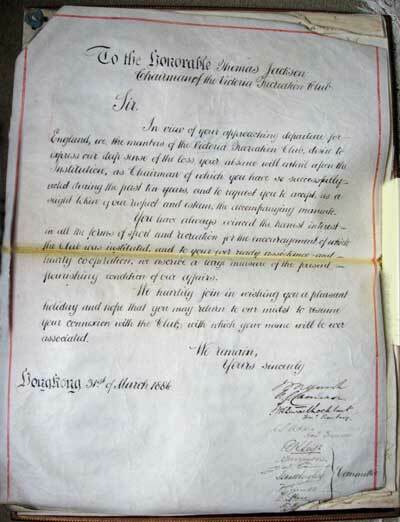 STEWART-LOCKHART then read the following address, to which was appended the signatures of the subscribers. To the HON. THOMAS JACKSON, Chairman of the Victoria Recreation Club. SIR, - In view of your approaching departure for England, we, the members of Victoria Recreation Club, desire to press our deep sense of the loss your absence will entail upon the institution, as Chairman of which you have so successfully acted during the past ten years; and to request you to accept as a slight token of our respect and esteem the accompanying memento. You have always evinced the keenest interest in all the forms of sport and recreation for the encouragement of which the Club was instituted, and to your ever-ready assistance and hearty cooperation we ascribe a large measure of the present flourishing condition of our affairs. We heartily join in wishing you a pleasant holiday and hope the you may return to our midst and resume your connection with the Club, with which your name will be ever associated. Then follow about 250 signatures. Hearty cheers were then given for Mr. Jackson, and the meeting terminated. We are requested to state that the screen will be on view for some days at the City Hall. Alexander Palmer McEwan. He was a director of Holliday, Wise & Co. and was also on the Board of HSBC at a time when Thomas Jackson was Chairman. Susan Evans emailed me July 20, 2012 to mention that McEwan had lived at The Grove at St. Leonards on Sea, East Sussex, a house that is no longer standing. He had quite an active role in the local politics. He is included with Thomas Jackson in one of the pictures that I have on my web site of Hong Kong Houses. G.D. BÖNING. He was a director of Carlowitz and Co. and was also on the board of HSBC in 1898. Carlowitz and Co. became leading importers of armaments and dies, supplementing their business in Manchester goods by obtaining British manufacturing agencies as well as by handling German exports, including acting as sole agent in China for Krupp interests. SOURCE: Hongkong Bank in Late Imperial China 1864-1902. Frank H.H. King. Cambridge University Press, 1987. P.467. James Haldane Stewart LOCKHART. (1858-1937) A long time civil servant, he founded the Hong Kong Football Club in 1886 and was an honorary member of the Royal Asiatic Society. He was a close friend of Sir Charles S. Addis and the two shared an long time interest in Chinese studies. William Henry MARSH. (1827-1906) There is a far flung family connection to Thomas Jackson. His wife’s sister, Anna Maria DARE married Whitworth ALLEN and his sister Amy ALLEN married Edmund Ironside MARSH the brother of Hong Kong Governor, Sir William Henry Marsh. He is also related to Hgaio MARCH, the famed writer. C.S. ADDIS. Charles Stewart Addis was born in Edinburgh on 23 November 1861, the youngest son of the Reverend Thomas Addis, a minister of the Free Church of Scotland. He was educated at the Edinburgh Academy. Between 1876 and 1880 he worked for Peter Dowie and Co., Grain Importers of Leith. In 1880 he joined the Hongkong and Shanghai Banking Corporation (HSBC) in London. In 1883 he was posted to Singapore, then to the HSBC head office in Hong Kong. In 1886 he became one of the first western bankers to reside in Peking, when he was posted there as Acting Agent. During this time, he also began his experience as a writer when he was invited to contribute material to the Chinese Times by its editor, Alexander Michie. After Peking, Addis undertook assignments in Tientsin (1889), Shanghai (1889-1891), Calcutta (1891) and Rangoon (1892). While on home leave in 1894 Addis met and married Eba McIsaac, the daughter of the Provost of Saltcoats, a small town in Scotland. They were to have thirteen children. SOURCE: National Archives. R.K. LEIGH. A civil Engineer with Messrs Leigh & Orange who lived in Hong Kong since 1881 (based on testimony: Report of The Commission Appointed by His Excellency Sir William Robinson, K.C.M G., Governor and Commander-in-Chief of the Colony of Hongkong and its Dependencies, and Vice-Admiral of the same, To Inquire Into the Existence of Insanitary Properties in the Colony, together with the evidence taken before the Commission, and other Appendices. Isaac HUGHES. Secretary of the Hongkong & Kowloon Wharf & Godown Co. SOURCE: Jardine Matheson Archive. F. GRIMBLE I know nothing about him, but I suspect he is related to Sir Arthur F. GRIMBLE who was born in Hong Kong and became Governor of the Seychelles. F.W. KOCH. I think he may have been American.